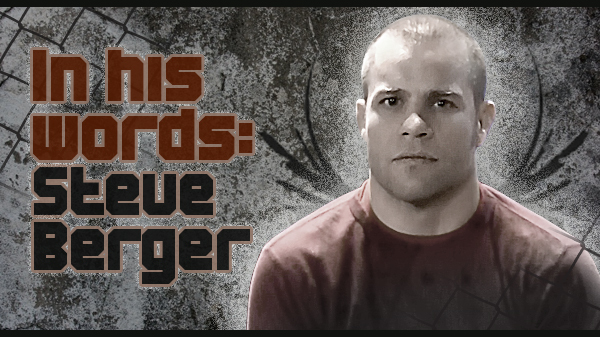 There are few names in the St. Louis MMA circle that carry as much weight, and deservingly so, as Steve Berger. When most of today's Tapout-wearing fans didn't know the difference between an armbar from a triangle, Berger was in the cage getting it done. He had his first pro fight in January of 1998 and by 2001 he had made his way to the sport's pinnacle; the UFC. During his career, Berger has logged over 50 fights. Now 38 and a successful coach and gym owner, Berger is still touching gloves. I sat down with Steve and talked about the ups and downs of his career, making MMA history with the first nationally -televised match, his near life-long friendship with St. Charles MMA coach Mike Rogers, and many other subjects. Be sure to check back in March for our video interview about his return to the cage. But now, here is Steve Berger. In his words. In high school I played football and was nothing to brag about. I wrestled and I was nothing to brag about. It wasn't until after high school that I really started coming alive. I was 27 when I first made it into the UFC. Everybody knew to train everything. I had always been a good brawler/street fighter. So I brought that and jiu-jitsu to the game. My wrestling wasn't very good and I definitely didn't have the technique with my hands. That was my biggest downfall, I think. I lost a lot decisions from wrestlers who learned how to defend the submissions. For UFC 32.5, I got a call with like two-and-a-half weeks notice to fight Robbie Lawler. I was like, ‘Alright, I'll take it,' because you don't say no the UFC. We'll be a trivia question. We were the first nationally televised show. The first round was great. We had a pretty even first round. In the second, he caught me and put me out. That was game over. I was gassed. It was neat. Before fighting I remember Dana (White) coming in and saying go out and create a show. Out of the three fights, they decided to pick mine and Robbie's to stick it on the Best Damn Sports Show, which was cool. I was going and fighting guys from (Pat) Miletech's camp and Matt Hughes' camp and other camps that were training the whole process. I guess I was around 32 at the time and I thought, I better break off and combine the whole deal and seeing as how there was no one else around I just started my own gig and I've been running with that ever since. I look back and I don't think I enjoyed it as much because I was scared to death. It was neat and I met a lot of neat people. I'm hoping to get another shot so I can do it right this time. The biggest thing I tell everybody is don't quit school, don't quit your day job and think that you're going to make a million bucks in the UFC. Good fighters are a dime a dozen. Make sure you have an alternate route. My dad used to always tell me, always leave a back door. That way, in case that front one closes you have one to run out. I wish I would have listened to him but I didn't. I was kind of a blue-collar guy and that's my back door which isn't a great option. I was into roofing a long time and I stayed in it. Now I broke off and I'm in the union. Mike (Rogers) and I have been best friends since I was eight years old. He's doing great. Mike was always a good jiu-jitsu player and a great wrestler and the whole bit. He's doing well and coaching his boys the right way. It was a lot of fights and you don't really keep track of them. There is not a lot of money in fighting, especially back whenever it was big for me so I would get calls all of the time, "Hey, do you want to fight so-and-so? And I was like, "Yeah, sure." It didn't really matter that I hadn't been training. I just figured it was a fight and I would make some money and that will be that. I know I'm 38 but I feel young, I feel strong. I know I can still fight. I may have a couple of years in me. If I get shutdown again, maybe that will be it and I will be a coach. I've learned a lot and I've got a lot of good, solid guys that can go far. Every once in awhile, because of youtube and the Internet and stuff, somebody comes up from out of the blue and says, "Aren't you Steve Berger? Didn't you fight Aaron Riley? Didn't you fight Shonie Carter?" It's always nice but it's not often but when it does happen, it's nice. It's been a fun, rewarding sport.